The American spirit flies high in Midwest City – especially at the annual Midwest City Tribute to Liberty! Whether you’re visiting family or friends from out of state or you’re a long-time Oklahoman, Tribute to Liberty is a very special Independence Day celebration you won’t want to miss. 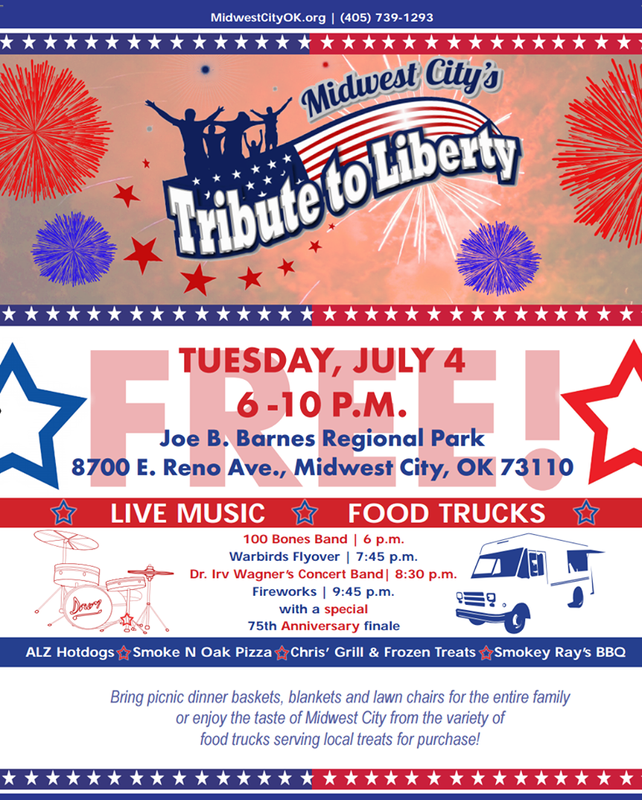 Tribute to Liberty will be held from 6-10 p.m. on July 4 in Joe B. Barnes Regional Park, located at 8700 E. Reno Avenue in Midwest City. The event is set to feature an array of live entertainment, food trucks, fireworks with a special 75th anniversary grand finale and more. Plus, families and children of all ages are sure to enjoy the Warbirds Flyover! Event attendees are invited to bring picnic baskets, blankets and lawn chairs. The event is free and open to the public. Fireworks will commence at approximately 9:45 p.m. Click here for more information. WATCH WHAT'S HAPPENING IN MIDWEST CITY. Subscribe to the Midwest City Convention & Visitors Bureau monthly e-newsletter, The Flyer, for up-to-date events, travel information and more.